You would have seen many birds in your lifetime, e.g. sparrow, crow, and a parrot. The ostrich is also the bird like them, but larger than all the birds found on the Earth. Ostriches can’t fly despite having wings. They are mostly known for their speed; they can reach a speed of 40 miles/hour (40 km/h). At such high speed, they use their wings to balance themselves during jumps and turns. They lay eggs that have the weight of about 3 pounds which makes them largest egg than any other bird. Ostriches are tallest birds reaching a height of about 9 feet and weigh as much as 135 kg (300 pounds). Their body is covered with feathers, males have black feathers and females have grayish colored feathers. They have a long neck, two long and slim legs, and a long beak. Ostriches have two eyes, each having a 2-inch diameter which is larger than every land animal. An ostrich can kick forcefully enough that, it can kill a human or a lion. 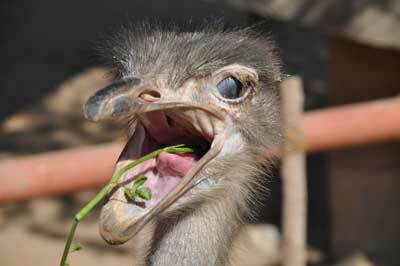 Ostriches can eat a wide variety of food in its diet. They can eat grass, seeds, fruits, small insects, and lizards. They even eat pebbles for helping their digestive system. Ostriches can live without drinking water for several days. Ostriches are found in the Africa. They mostly prefer open lands, but they are also found in desert areas of Sahara. Also, People around the world domesticate the ostriches for meat. 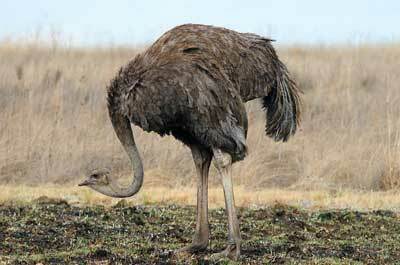 Ostriches are placed in the least concern category, but their number has also decreased. Since ostriches are domesticated around the world, which helps to maintain their population. It is the famous belief that ostriches bury their heads in the sands when they have fear of danger. But, in reality, they lay their heads on grounds to avoid being spotted by predators. 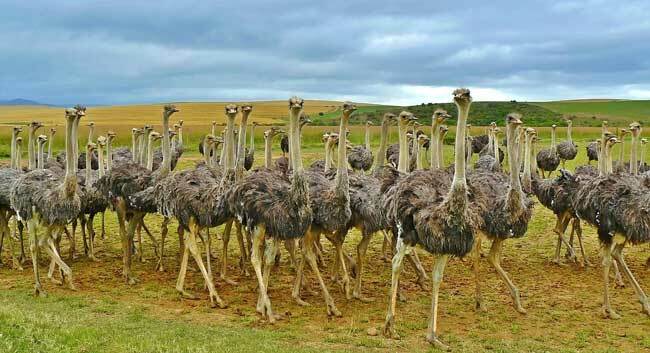 Ostriches can run for hours while maintaining its speed to 30 miles per hours (48 km/h). They make their nests on the ground. The size of their nest can reach 3 meters in width. 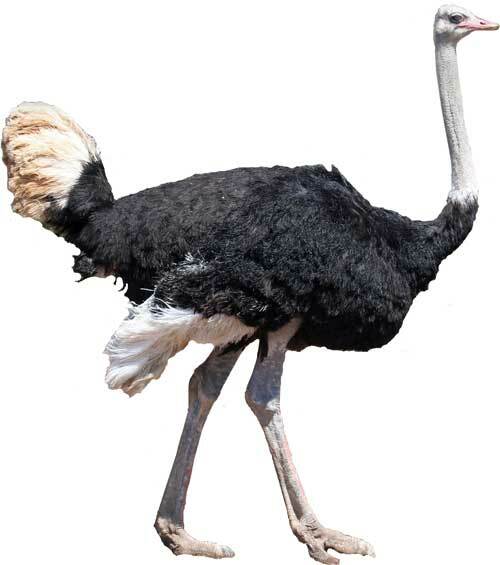 Abdul Wahab, "Ostrich," in Science4Fun, April 13, 2019, http://science4fun.info/ostrich/.